I was a little disappointed with myself this year as I didn’t get as many of my outdoor summer projects done as I would have liked to but that’s ok because I either took notes, took pictures or bookmarked anything that caught my eye or interested me. I want to share the top five summer projects that ended up on my “to do someday” list. Wire Whisk Butterfly- the tutorial can be found on dollar store crafts blog – it’s not only inexpensive, it’s quite an easy project – just the way I like them. 2. The next two things on this list are totally inspired by the blog Organized Clutter and her 2015 Junk Garden Tour – I just love this idea and was lucky enough to score some of these cast iron shoe molds at a vintage sale – happy, happy, joy, joy!!! 3. Being a vintage collector and a true blue junker, this soooo appeals to me. The only piece I have so far is the antique washing agitator, but it sure is going to be fun to source the rest of what I will need – luckily I will have three seasons to hunt! 4. Insulated Mason Jar Bag by Sew Mama Sew. The tutorial is very well written and the pictures look like it will be easy to follow. I know these could be made and used any time of the year but I like the thought of using them on a picnic. 5. I like the idea of upcycling an old light fixture into a bird feeder. Easy, simple and few supplies needed. This could be hung on a fence or a deck if you don’t have any big trees in your yard. Projects to look forward to…A Wandaful Thing indeed! This entry was posted in DIY and tagged antique, cheap, Crafts, Decorate, DIY, easy, ideas, inexpensive, repurpose, reuse, summer, vintage. Bookmark the permalink. 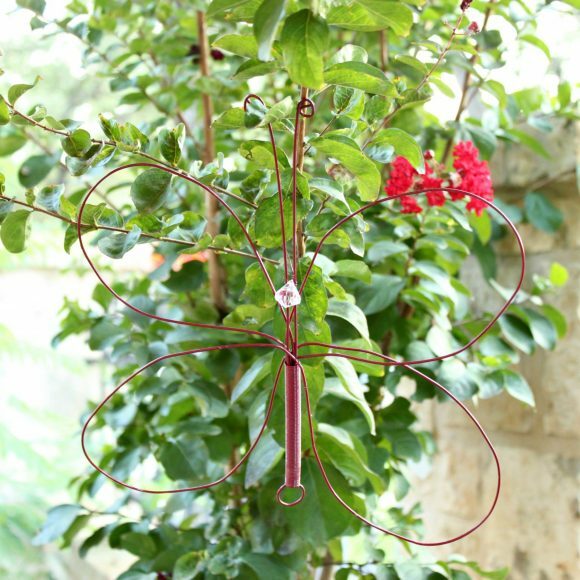 Made the whisk butterfly – super easy and cute.